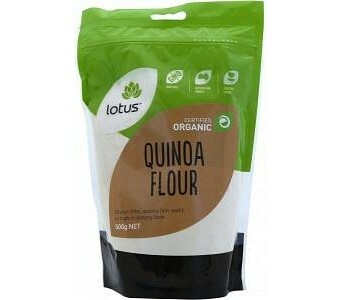 Lotus Organic Quinoa Flour is gluten free and high in dietary fibre. It is milled through stone mills from the whole grain. The only heat applied to it, is the heat cause by the friction of the stones and product during the milling process. Ingredients: Organic Milled Quinoa Grain. No Preservatives or Additives. Certified Organic by ACO.